Valet testimonials -Car Valeting, Leather Repair, Interior Scratch Repair. "1st class service, very reasonable prices and thoroghly pleased with the valet. Will recommend when possible and use again in the future." "Very please with the leather repair. Has transformed the look and feel of the car interior. Will certainly be recommending your services to colleages." "Very pleased with valet and waxing. Scratches on n/s front plastic trim satifactorally repaired. Overall a good job with a nice S.M.A.R.T. " "I was very pleased when I got the car back. It looked like new. Sean who looked after the car had a real interest in the job and took time and trouble to explain things. I felt he had a real pride in his work. I will now make 'Clean Image' an anual part of the car's life. " "I was worried the stains on my car were not removable, excellent job, would definitely recommend to anybody who needs the work done. " "Not bad for £60! " 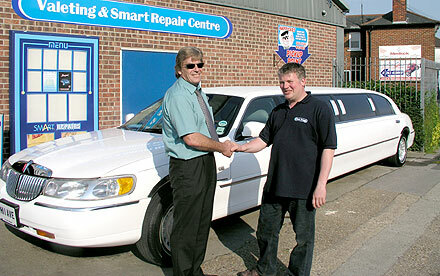 Chinney was refering to our paintless dent repair service. "Excellent service with an eye for detail, helpful guideance to avoid overspending." "I think the service provided was very good, as well as keeping me informed of progress of my vehicle. In particular, Gary who served me was very helpful. I will almost certainly recommend you."